The NHL helped end a stalemate between the U.S. women's national hockey team and USA Hockey last year by bridging a "sizable" financial gap, NHL deputy commissioner Bill Daly told ESPN. In an agreement that was kept under wraps until this week, the NHL agreed to pay USA Hockey $25,000 per player to help fund their four-year agreement with the women's national team. 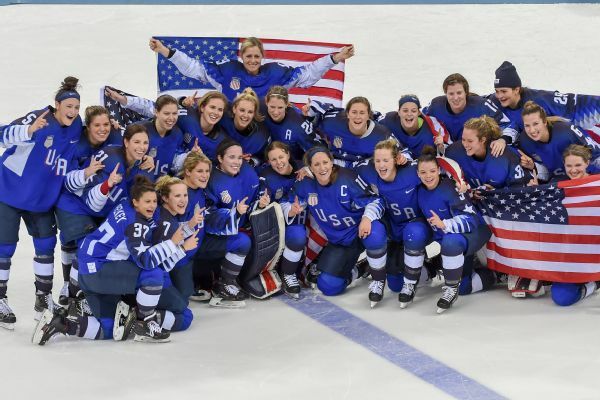 In March 2017, the U.S. women's team was in a bitter showdown with its own organization over what the players felt was complete inequity with the men's program, given their accomplishments, which at that point included three straight titles at the IIHF Women's World Championship. But on March 28, an agreement was finalized that ended that contentious negotiation, which had included the threat of an international tournament boycott and USA Hockey seeking to use younger replacements on the national team. What wasn't known at the time: How much that cease fire could be credited to a curious third party -- the National Hockey League. The NHL's role was first reported by the Associated Press. "We already direct a large amount of support dollars to USA Hockey on an annual basis to promote hockey development in the U.S.," said NHL deputy commissioner Bill Daly, in the league's first public confirmation of the payment. "When the issue with the women's team arose last year, USA Hockey had to find dollars to reallocate to the women's program and they were still facing a sizable gap in funding. We felt like it was the right thing to do to help them cover that gap or shortfall." The "living wage" that was established by the settlement was about $71,000 per player. That includes between $14,000-$21,000 contributed by the United States Olympic Committee in a tiered stipend system. Stars like Hilary Knight are in a compensation tier that pays around $21,000 annually, while lesser-known players are on the other end of the scale. Outside of USOC's contributions and the NHL's $25,000 per player, the rest of the money comes from USA Hockey. There are also performance bonuses above their salaries. For winning the gold medal, U.S. women's national team players received a bonus of $37,500, which by federal law is tax-free. The settlement ended a few weeks of very public acrimony between the players and USA Hockey. The U.S. women's hockey team won the Olympic gold medal in February. Sixteen days before the 2017 World Championship was scheduled to start in Michigan, the U.S. women's team announced it would boycott the showcase event. At issue was everything from securing a "living wage" for the players, to increases in travel and insurance benefits, to sharing the spotlight when it was focused solely on the men's team. USA Hockey responded by attempting to assemble a "Plan B" national team of younger U.S. players, but the organization was rebuffed. It then tried rec league and high school players, but found they were in lock-step with the national team. When the NHL was asked to get involved, or decided to, is unclear. But that involvement had been kept quiet for over a year. USA Hockey didn't disclose their involvement, and the women's national team players were oblivious about it at the time. "I am unaware of USA Hockey asking for more money from the NHL to help support our contracts and/or women's hockey," said Olympic gold medalist Monique Lamoureux-Morando, via text. USA Hockey spokesman Dave Fischer told ESPN that the NHL has been a longstanding financial supporter of the organization, but that the perception that they were essential to the eventual settlement was "not accurate," and that a deal "would have gotten done." The U.S. went on to win the World Championship for the fourth consecutive year and proceeded to take the gold medal at the Olympics this past February. In hindsight, there might have been signs pointing to a third party offering input. According to a source familiar with the negotiations, there was a late offer from USA Hockey that had "different language" than had been previously presented when it came to marketing rights for the players. The players rejected that offer, reverting to the language from a previous agreement. The source said the suspicion has been that that NHL helped craft that proposal. One of the baffling aspects of the NHL's involvement: Why keep it quiet all this time? Was it to keep the positive focus on USA Hockey, which was maligned during this negotiation by everyone from media to fans to NHL players? Would it have been an awkward look for the NHL to offer additional funding to the women's national team while it pulled its players from the men's national team? The women's settlement was announced on March 28, 2017. The NHL formally announced it would not send its players to South Korea on April 3. Daly said there's nothing further behind the league's motivations than just doing the "right" thing for the U.S. women's national team. In the end, that players that finally took home Olympic gold for the first time since 1998 -- finally defeating arch rival Canada in a shootout -- are just happy the matter was settled in an equitable way. "I know the women's national team wants to work in collaborative effort with USA Hockey moving forward, in ways that benefit not just the women's team but all of hockey," said Lamoureux-Morando. "The end result of doing that is a win-win for everyone."